Majority of the power plants in the United States are still powered by coal and natural gas, making them critical infrastructure in the U.S. As plants are the foundation of revenue for most power generation companies, it is important to have their assets up and running as much as possible. Companies inspect inside the structures identified below to look for damage, build defects, or routine wear & tear. Typically, these inspections are performed with rope access, cranes, or erecting scaffolding inside the structure – all in which sacrifice a plethora of time. To highlight a much more effective solution, the lead Boiler Inspector at one of the top U.S. power companies recently told Interactive Aerial “it took 60-man hours to get the exact same pictures your drone took ten minutes to get.” Their team inspected the burners on one half the boiler using a traditional buggy cart and our team flew the Legacy One to get the second half of the boiler inspected, then we compared data. This company purchased multiple Legacy One’s and is now reducing its scaffolding requirements in lieu of newer robotic inspection methods. Interactive Aerial joined a Midwest power company to inspect one of their large coal boilers. They intended on keeping the plant down for 3 days to build scaffolding to 4 specific areas of repairs from the previous outage. With the Legacy One, we inspected each of the four areas in less than 45 minutes. An on-the-spot decision was made by the plants chief engineer not to build scaffolding and to get the plant back up and running immediately, saving this company tens of thousands in scaffolding cost alone. By getting this boiler back online two days earlier than planned, they saved hundreds of thousands of dollars in downtime by not paying the union to scaffold and back to producing power themselves, rather than buying it off their competitors. In April 2018, our team worked with a major U.S. power producer to test out drones during their annual boiler outage. They wanted to prove scaffolding wasn’t needed for a routine inspection. Our drone, combined with a UT thickness wall crawling robot, made a full coverage inspection of the boiler. They ultimately decided the combined robotic inspection with the wall crawler and our drone was successful. This plant used to scaffold the entire boiler every other year, but is now reducing that requirement to every five years due to this test. Implementing this company wide will save them millions of dollars annually. This company also determined that the drone will be the first item to make entry to the boiler during the outage. It will make an initial visual assessment of the boiler before the full outage commences. During a recent spring outage, our team was asked to help a power company inspect a HRSG boiler. The environment was 100% dark and the company had never used a drone before. We found numerous defects which we accurately tracked with our Photo Measurement Software. The engineers “saw parts of the boiler we hadn’t seen since it was built,” because their company could never justify the cost for tens of thousands of dollars in scaffolding. This year, they have used drones in a majority of their outages, saving days of downtime and thousands of dollars. Why waste days of extra down time to prepare and execute traditional inspection methods? Our drone can inspect these steel enclosed structures in a matter of minutes, rather than days. Whether it is verifying a few specific areas of repair from previous outages or visually checking the entire boiler for flat spots on the tubes, the Legacy One should be the first tool chosen when beginning an outage. Let our drone be the first object to make entry inside the boiler when it comes offline. It can be the robotic “birds-eye-view” to tell your company exactly what needs to be ordered during your outage. 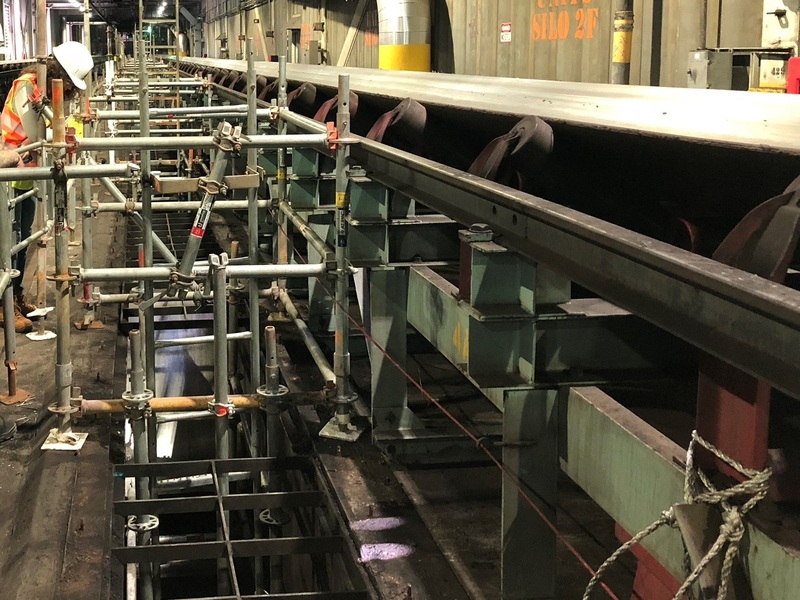 In April 2018, our team worked with a major U.S. power producer to prove scaffolding wasn’t needed for a routine boiler inspection. Our drone, combined with a UT thickness wall crawling robot, made a full coverage inspection of the boiler. The power company ultimately decided the combined robotic inspection was successful. This plant used to scaffold the entire boiler every other year, but is now reducing that requirement to every five years due to this test. Implementing this company wide will save them millions of dollars annually. This company also determined that the drone will be the first item to make entry to the boiler during the outage. It will make an initial visual assessment of the boiler before commencing with repairs. Managing coal supply at a power plant can require a whole team to oversee. Legal requirements mean a company must have several days of emergency backup coal onsite. This typically results in coal storage using many different assets – whether they be inside the plant or outside. 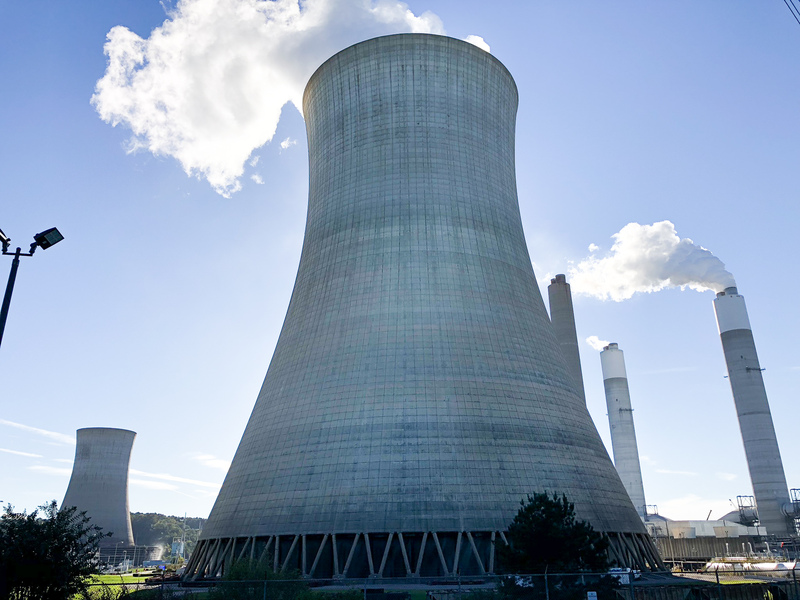 Following a recent coal bunker integrity disaster at a US power plant, multiple companies have implemented procedures to inspect inside these assets during plant shutdown. 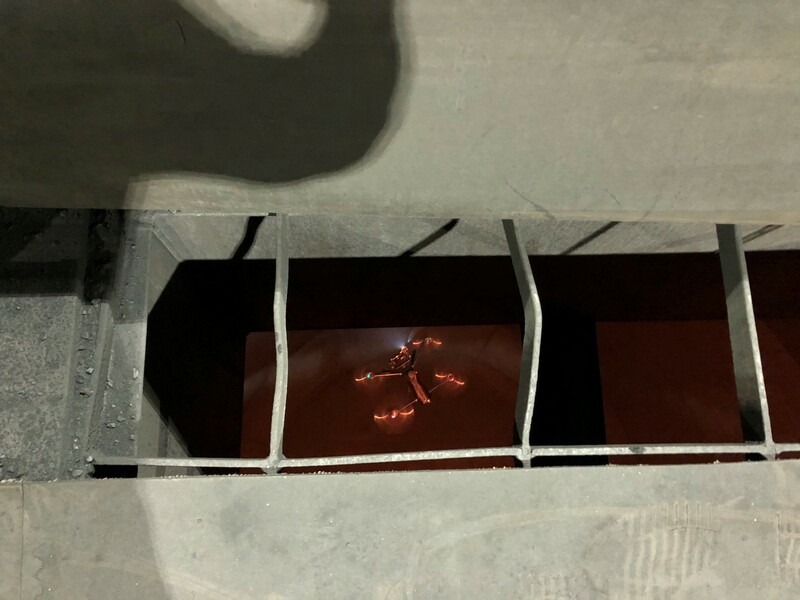 In 2018, Interactive Aerial flew the Legacy One inside a coal bunker by accessing the tank from the open top via temporary scaffolding. Pilots took off and flew below them to see the bottom funnel welds, along with the steel rafters that support the coal belts one floor above. Scaffolding these tanks are near impossible but using drones like the Legacy One makes it a simple and quick accomplishment. If your company has hyperboloid cooling tower on your asset list, there’s a decent chance it does not get routinely inspected. By looking at the sheer size, it’s easy to understand why cost outweighs the value of checking these structures closely. The advancements of drone technology make 100% coverage of a cooling tower inside and out possible in just a few days’ time. Not only can your company gain a clear visual inspection of every inch, but sophisticated stitching software allows for a beautiful 3D model picture mosaic! 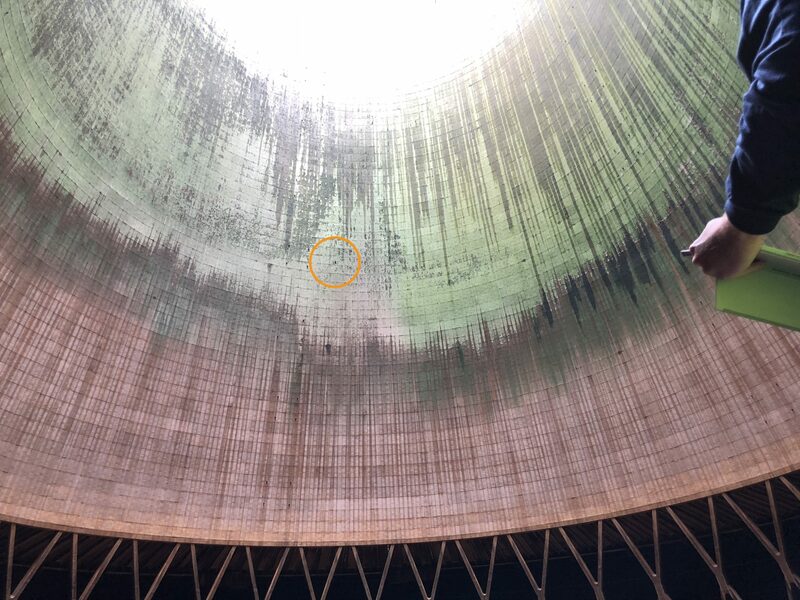 In 2018, Interactive Aerial flew inside its first hyperboloid cooling tower, hundreds of feet in the air, over 4ft of standing water. The photo above was captured by the Legacy One 15ft away from the wall. daunting task. With current updates from Interactive Aerial, it’s easier than ever to assess the condition of your stack. Learn more about what we have to offer on our Flare stack Page. 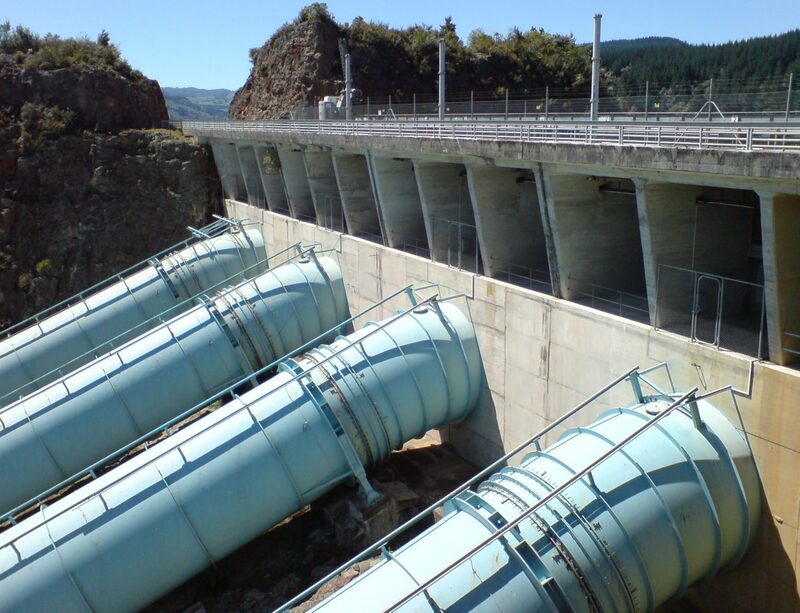 Penstock – Penstock tubes at power plants create power through water flowing with gravity. These large tubes are often 20-30ft wide and could certainly be inspected with the Legacy One in lieu of climbing hundreds of feet up! 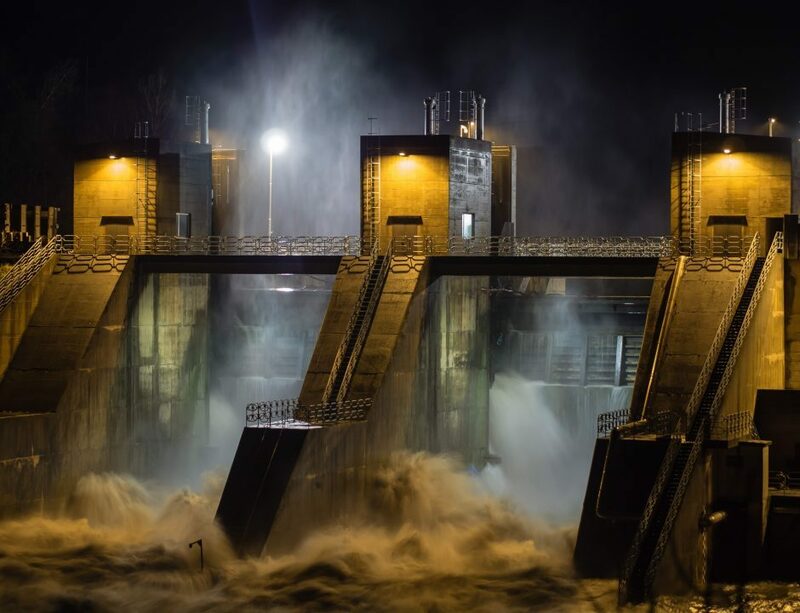 Hydroelectric Dams – These large power production facilities are complex structures that may require flights to multiple different hard to reach areas. Consider the Legacy One to access those large vertical walls!